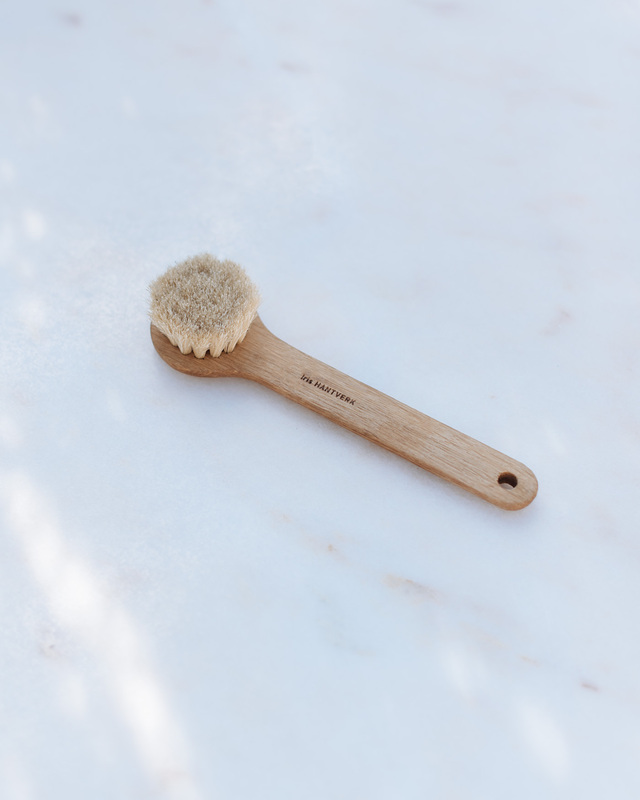 My face brush is made of oak and horsehair and it comes from Iris Hantverk, a small Swedish company specialized in handmade brushes. 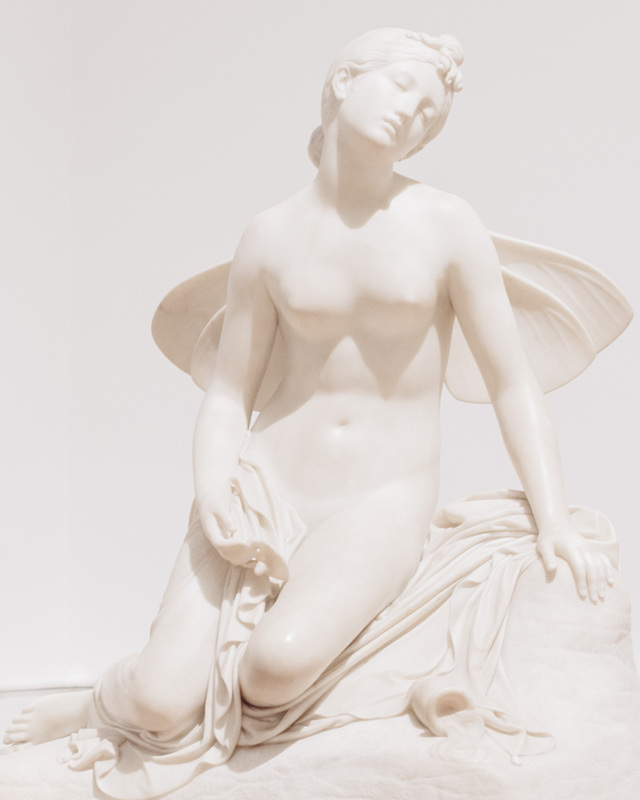 Sculpture ‘Psiche svenuta’, 1823, by Pietro Tenerani, photographed in La Galleria Nazionale in Rome, January 2017. I love dry skin brushing. Have you tried it? Not only is it good for you but it feels so good. Your largest organ, the skin, gets the attention it deserves, and by brushing it you help it manage and eliminate toxins within. The purpose of dry skin brushing is to support circulation and the flow of your lymph. Your metabolism and immune system get a boost, which means you help your body to detoxify naturally. Dry skin brushing also removes dead skin cells so that your pores are able to breath out stuff that needs to get eliminated from the body. Dry brushing can also diminish the appearance of cellulite but I try not to pay too much attention to that. I find that often the determination to see clear results leads into measuring and comparing, which easily lead into some kind of dissatisfaction. Suddenly the thing you started out of pure joy is far from joyful. This does not mean the great results would not be real, though. They are! You skin is firmer and softer and has a better color. Dry skin brushing is best done in the morning because that is when the skin is at its driest. The ritual also has refreshing benefits as it boosts circulation and stimulates the lymph nodes allowing your body to wake up gently but effectively. Making little circles, start at your feet and brush upward towards your heart. Move on to your arms starting at your hands and working upward towards the heart. The idea is to brush the entire body and using circulating motions and long strokes, gently move lymph towards the lymph nodes. To learn where the lymph nodes exist and how to work through your buttocks, belly, chest and neck, take a look at the dry skin brushing chart here. For a head to toe treatment, it is recommended to have three different brushes: one for face, one for body, one for feet. Spend some time researching and testing which brush is best suitable for your skin. The bristles should be hard enough for you to feel that dry skin is being brushed away yet not so hard that they cause any irritation or breaking of the skin. I like brushes with a wood handle and natural bristles. The smaller the handle, the better. The stretching that comes with brushing is good for the muscles, so it serves you well having to reach out a bit when brushing your back for example. Iris Hantverk is a small Swedish company specialized in beautiful handmade brushes. Have a look. Keep your brush clean by washing it regularly with washing-up liquid and warm water. Let dry bristles down, and if needed, re-oil wood handle with food grade oil. When I am not traveling, I dry brush my body several times a week before my morning shower. Feet first, I have a brush with slightly harder bristles for the soles. Showering and applying moisturizer afterwards finishes off the ritual. Or, for the ultimate pleasure, dry brushing is followed by a hot bath, a cold shower and finally, body oil.